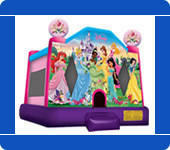 Disney Princess Bounce House | Renting a Princess Bouncer | The Inflatable Fun Co. Finally a bouncer fit for every Princess. The Disney themed Princess Castle is perfect for all ages.